Ngapuhi Tuturu Women's Cap Sleeve T-Shirt The design used for this Ngapuhi Tuturu T shirt is the mangopare, or hammerhead shark which frequents the waters around Ngapuhi and the Tai Tokerau. Contrasting neck and shoulders with a form-fitting, contoured fit clings to women's curves. Ngapuhi Nui Tonu Women's Cap Sleeve T The design used for this Ngapuhi Nui Tonu T shirt is the mangopare, or hammerhead shark which frequents the waters around Ngapuhi and the Tai Tokerau. Contrasting neck and shoulders with a form-fitting, contoured fit clings to women's curves. Ngapuhi Nui Tonu Women's Cap Sleeve T-Shirt The design used for this Ngapuhi Nui Tonu T shirt is the mangopare, or hammerhead shark which frequents the waters around Ngapuhi and the Tai Tokerau. Contrasting neck and shoulders with a form-fitting, contoured fit clings to women's curves. Ngapuhi Tuturu Women's Cap Sleeve T The design used for this Ngapuhi Tuturu T shirt is the mangopare, or hammerhead shark which frequents the waters around Ngapuhi and the Tai Tokerau. Contrasting neck and shoulders with a form-fitting, contoured fit clings to women's curves. Nga Puhi Northland Maori (Blue) Women's Cap Sleeve Get into sporty, stylin casual comfort with our Cap Sleeve Raglan. Looks great on the go or just hangin out. Made of 100% combed ring-spun cotton that gets even softer with each washing. Available in different colours. Nga Puhi Northland Maori (Red) Women's Cap Sleeve Get into sporty, stylin casual comfort with our Cap Sleeve Raglan. Looks great on the go or just hangin out. Made of 100% combed ring-spun cotton that gets even softer with each washing. Available in different colours. 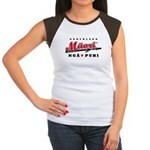 Nga Puhi Moko Women's Cap Sleeve T-Shirt Get into sporty, stylin casual comfort with our Cap Sleeve Raglan. Looks great on the go or just hangin out. Made of 100% combed ring-spun cotton that gets even softer with each washing. Available in different colours. Nga Puhi Women's Cap Sleeve T-Shirt Get into sporty, stylin casual comfort with our Cap Sleeve Raglan. Looks great on the go or just hangin out. Made of 100% combed ring-spun cotton that gets even softer with each washing. Available in different colours. Nga Puhi Northland Maori (Brown) Women's Cap Sleev Get into sporty, stylin casual comfort with our Cap Sleeve Raglan. Looks great on the go or just hangin out. Made of 100% combed ring-spun cotton that gets even softer with each washing. Available in different colours.